JGuitar is pleased to introduce the chord search engine. Type in a chord symbol and try it out. JGuitar is a set of useful tools for players of stringed instruments. JGuitar's powerful chord and scale calculators replace traditional chord and scale dictionaries by providing dynamic calculation which works for any stringed instrument in any tuning. Users can alter the tunings of the instruments and even the instruments themselves. In fact, JGuitar was designed to work with any number of strings or frets. Our best of breed tools are gaining a reputation as the best on the web. Once you try JGuitar, you'll never look for another chord finder again. Trying to learn a song and need some chord diagrams? No problem, just ask the chord calculator which will usually present several ways to play a chord. Found some guitar tablature on the web? 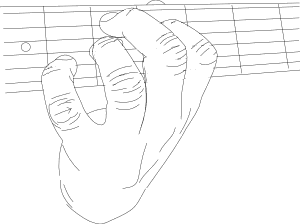 Just enter the web address into the tab mapper and presto, all the chords from the tab file will be diagrammed. Need to know what the heck a chord is called? Enter it into the chord namer. We'll be adding more tools in the future and improving the ones we have based on your feedback so feel free to use our contact page to send us any feedback. We would love to read it.